Join WXXI and Al Sigl Community of Agencies for a FREE screening of The Rebound – part of Dialogue on Disability special programming. Dialogue on Disability, WXXI’s annual initiative with Al Sigl Community of Agencies, kicks off Monday, January 8 with a week of special programming designed to stimulate dialogue about people of all abilities and to motivate us to be a more inclusive community. The centerpiece of the week is a FREE screening of The Rebound on Wednesday, January 10 at 6:30 p.m. at the Little Theatre (240 East Ave.) in theater 5. 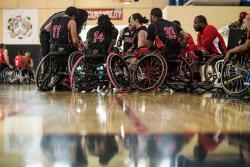 The documentary follows the underdog journey of the Miami Heat Wheels, a wheelchair basketball team, in their quest for a national title. Three adaptive athletes rally their team to victory while confronting obstacles on and off the court. The story is a visceral portrait of the athletes’ journey to realize their dreams while facing life’s biggest challenges. The screening with be followed by a discussion with the director, Shaina Allen, (via Skype) and local experts in the theatre. Debut filmmakers Shaina Allen (Director) and Mike Esposito (Producer) step deep inside the lives of three players as they endure and respond to adversity, and fight their way to a second chance. Friends, family, and pride hang in the balance as these men find an extraordinary gift in the hand life has dealt. They hope for an education, a big break, and a new life. Since 2003 WXXI and Al Sigl Community of Agencies have worked together to help break the ingrained stereotypes about individuals with intellectual and physical disabilities with its week-long initiative. Dialogue on Disability is made possible through support from the Fred L. Emerson Foundation. The partnership between WXXI and Al Sigl Community of Agencies is supported by the Golisano Foundation and Move to Include, a project designed to build a more inclusive community by inspiring and motivating people to embrace different abilities and include all people in every aspect of community life. For a complete schedule of Dialogue on Disability programming, click here.